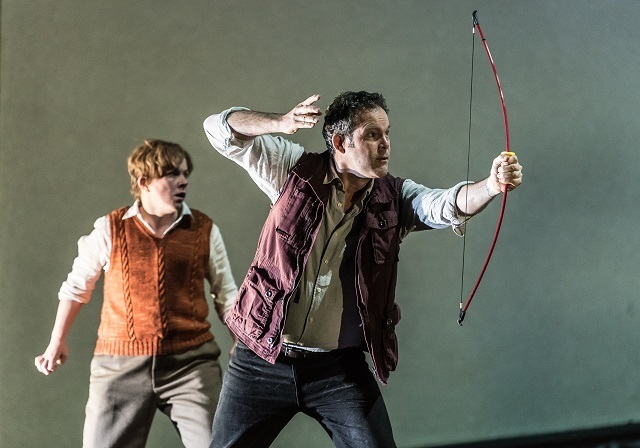 Guillaume Tell may be pictured by some as some endearing revolutionary Robin Hood of the Alps but the latest outing of Gioachino Rossini’s work about the Toblerone of rebel archers caused a very real audience uprising in the Royal Opera House on opening night. Set in medieval Switzerland, our eponymous hero lives in a land ruled by the Austrian tyrant Gesler. During a first act which celebrates how the base materials of love and joy can be transmuted into weddings and marriage, Tell sees his village elder murdered by the occupying soldiers and so begins his uprising. This is the first time that Guillaume Tell has been staged in Covent Garden since 1992 and director Damiano Marchietto can’t be faulted in terms of ambition. Taking on a four-hour stage production in itself is no mean feat. Marchietto fills it with a huge cast replete with a number of choruses; ten children alone are used just for a bathing scene towards the end. The set design is exceptional and eye-opening, featuring a sixty-foot tree as a centrepiece for much of the four hour running time. Lighting is spectacular too, adding buckets of depth and mood throughout. That same ambition, though, proves self-destructive. The large choruses on stage make it difficult to tell where the main characters are or which of them is singing. Having so many bodies on stage at a time means that too often we are left looking at a static tableau. The effect is to drain Tell of much of what dynamism it has. Further, the surtitles are poor translations which, while being close in sentiment, are far from accurate. The conductor may be the ROH’s musical director but doesn’t do this opera any favours by deciding to forego the traditional baton; if he hoped that his jazz hand waves would keep the chorus and orchestra in sync, he was sorely proved wrong. The most controversial scene occurs in the third act when we see the villain Gesler and about twenty of his officers hold a banquet to celebrate a centenary of Austrian rule over the Swiss. At one point, a serving woman is forcibly passed between the men. Wine is poured over her head until her dress is soaked. She is gang-groped at gunpoint by the laughing mob before being lifted onto the dining table. There, her dress is roughly removed and she is briefly shown to be naked before Guilluame Tell covers her in a cloak. And as we reported yesterday, the audience reaction to this scene includes very loud boos and cries of “needless” and “gratuitous”. The crowd is partially won back by the strong performances which follow but the opening of the fourth act sees more booing as well as some pointed remarks about the static directing. There was a split at the finale with the cast heartily applauded but the director and several others clad in ominous black appearing on stage to loud expressions of disapproval. The performance of Guillaume Tell on 5 July at 3pm will be relayed live to more than 1,500 cinemas in more than fifty countries as part of the Royal Opera House Live Season. BBC Radio 3 will broadcast the production live on 14 July. More information on the current run can be found at roh.org,uk. Londonist attended on a complimentary press ticket.